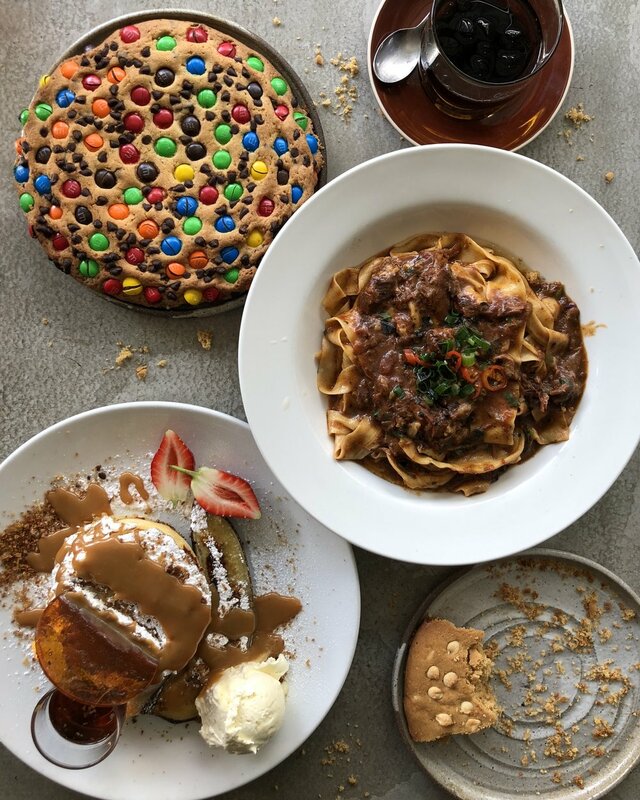 In this short piece, I visit one of Zomato's most top rated cafes in Sydney and I try their famous giant M&M's cookie, and one dish makes it to the top of my list this winter. Flour Drum had been on my radar for quite some time. After seeing it posted on Instagram a picture of a giant cookie sprawling with M&Ms, there was no surprise that it caused quite a stir in the Sydney food community, and after investigating what the fuss was about I knew I had to get my hands on one of those monstrous cookies myself. We came on a Sunday morning at around 11 am. It was very busy with groups of people already waiting outside, we couldn't make it in time to beat the rush. With customer eagerly pouring in the door this only means one thing... there is something inside worth rising to the occasion for. Luckily we eventually got a table within 15 minutes. Long black and cold drip coffee by The Blind Coffee Roasters. Our espresso has a nice kick to it, a bit on the acidic side but mellow to finish. The cold drip was punchy too, bright and almost on the verge of spicy - loved it. We got two of their famous cookies: white chcokade macadamia and the mms and smarties. The cookies are light and crumbly, very pleasant and easy to eat and are not too sweet. We ordered the Banoffee Buttermilk Pancake Stack with Grilled Caramelised Cavendish bananas, Dulce de Leche, Toffee, whipped cream and mascarpone, toasted Anzac biscuit crumbles and maple syrup. The pancake stack was done well; it was light and fluffy and the sweet additions of banana and caramel with cream was a good combination of flavours so that even though it was sweet it was still balanced. The house-made Parpardelle Pasta with 8 hours braised Australian Lamb Shank Ragu with shallots and chilli infused olive oil and Cyprian Volcanic Black Sea salt. Perfectly cooked well-seasoned pasta, the lamb incredibly tender, the chilli infused oil helping to tie everything together to create one of my favourite dishes this winter. Conclusion: If you have time to spare, get in line to grab a table for amazing food and coffee. Instagram factor: Dark interior, best lighting is by the window or outside.